People often give a lot of intention to the last words of famous individuals in the hopes of discovering the meaning of life or at least the meaning of life of these people in their last moments. And it is always interesting to read about what prominent artists, heroes, writers, celebrities, scientist or leaders had to say in their final moments. Some last statements are brave and give us hope, others give us a glimpse of what maybe lies in the afterlife, some are expanding our understanding of the people who uttered them and some are just very honest, sometimes even comical. The following are ten of the most interesting and most famous last words of prominent people that we love, admire or find interesting. Leonardo da Vinci was a brilliant Italian painter who is best known for his work “The Last Supper” and “Mona Lisa”, some of the most famous paintings of all time, and brilliant inventions. He was a true Renaissance man, gifted in many areas. He was an artist, inventor, scientist, engineer, and mathematician – in short, a universal genius. 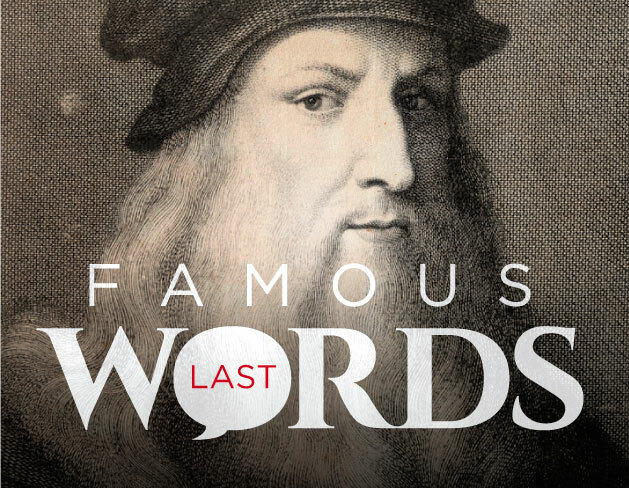 His last words were, “I have offended God and mankind because my work did not reach the quality it should have.” Leonardo da Vinci probably accomplished more in his life than any other man in history, but his final words show how humble and modest he was in his striving for perfection. Josephine Baker was a famous dancer, singer, and actress, who was in her time one of the most popular and highest-paid performers in both France and much of Europe. This remarkable “Black Pearl” and “Black Venus”, how she was often called, was breaking the rules all her life. She helped the French Resistance movement, fought against racism in America, she sang and danced, adopted a dozen of kids, married couple of times and lived her life to the fullest. Her last words were, “Oh, you young people act like old men. You have no fun.” They were spoken to a young guy in Paris who was trying to take her home from the party being held in her honor when she only wanted to stay out and have fun. She died of a stroke later that night. Harry Houdini was brilliant American escape artists and one of the greatest magicians of all time. Many of his illusions, like escaping from police handcuffs and jail cells, straitjackets, and coffins, padlocked-can filled with water or even his famous Chinese Water Torture Cell stunt have made history in the fields of magic. Walt Disney is one of the most important cultural figures in American history. He was a true visionary, business magnate, creator of Mickey Mouse, founder of Disney World, and a pioneer in the making of animated cartoons. His animated creations have brought and continue to bring laughter and enjoyment to fans around the world. Just before he died of lung cancer, Walt Disney scribbled two words on a piece of paper: “Kurt Russel”. To this day, nobody knows what the innovative genius meant by it, not even Kurt Russel, who was at that time working for the Disney studio as a child actor. Although similarities with cryptic Charles Foster Kane’s “Rosebud” exist, most likely Disney was talking about hiring a young child star. There are not many people who are not familiar with the biblical story of Samson and Delilah. Samson was one of the last judges of the Bible who possessed extraordinary physical strength given to him by God to perform heroic feats. But he also had two significant vulnerabilities – his love for untrustworthy women and his hair, without which he was powerless. Samson fell in love with Delilah who deceived and betrayed him by having a servant shave his seven locks of hair. He lost all his strength and was captured, blinded and enslaved by the Philistines. But at the end, this remarkable biblical figure got his revenge. “Let me die with the Philistines,” were his last words addressed to God. Through the return of his strength, he destroyed the great Philistine temple and his enemies but perished with them. Ian Fleming, British writer, journalist and wartime intelligence expert, is best-known as the creator of the famous James Bond spy novels. Twelve novels and few short stories that he wrote about Agent 007, including Dr. No, Goldfinger, Diamonds are Forever, Casino Royale, From Russia, with Love, became the foundation of one of the most lucrative franchises in the film history. Although he was hugely successful as a writer, he didn’t live long enough to see the enormous success of his creations in movies. As a notorious smoker and drinker, Fleming suffered from heart disease. When he was rushed to the hospital after his second heart attack, he apologetically said to the ambulance drivers, “I am sorry to trouble you chaps. I don’t know how you get along so fast with the traffic on the roads these days.” These were his last words. He died at the age of 56. Frida Kahlo is best known for her self-portraits and stormy marriage with painter Diego Rivera. She started painting as a form of therapy after she survived near-fatal bus accident at the age of 18. Despite all the pain she suffered all her life, she managed to become a world-famous artist and an icon of female strength and creativity. According to famous anecdote, when the city of Syracuse was taken by the Romans, Archimedes was discovered in the marketplace studying some figures he had drawn in the sand. A Roman soldier approached him and Archimedes spoke his last words: “Do not disturb my circles” a quote that that is often given in Latin as “Noli turbare circulos meos”. Despite being given explicit orders not to harm him, a Roman soldier killed the 75-year old mechanical genius because he refused to leave his mathematical diagrams. Errol Flynn reportedly once said: ‘I like my whiskey old and my women young’. Australian-born American actor who is best-remembered as a swashbuckling and dashing hero of the silver screen, especially in movies like Captain Blood and Adventures of Robin Hood, privately lived fast and scandalously, drinking, fighting, boating and womanizing. He married three times, hung out with Fidel Castro, inspired the expression “in like Flynn” and led a life far more adventurous than any of his films. He died in 1959 in Vancouver just four months after his 50th birthday. Now broke and critically ill Hollywood star collapsed and died of a massive heart attack. Before dying, he apparently said: “I’ve had a hell of a lot of fun and I’ve enjoyed every minute of it.” He was buried with six bottles of whiskey. Salvador Dali, Spanish painter, filmmaker, performance artist and eccentric self-promoter, probably is best known for his painting of melting clocks, The Persistence of Memory, although his Mae West Lips Sofa and Lobster Telephone are also considered as one of the best achievements of Surrealistic movement. During his life, he was often in public spotlight because of his extravagant behavior, but today he is widely recognized as one of the greatest painters of the 20th century. After Gala, his wife, muse and manager for half a century, died of a heart attack, Dali went downhill very quickly. He entered a difficult period of deep depression; he had several accidents and illness, possibly suicide attempts, and died of heart attack in his hometown Figueres at the age of 87. His last words were, probably a reference to his work, “Where is my clock?”.